Reconstructed residence from functionalistic era of the 30s. Wouldn't stay anywhere else. 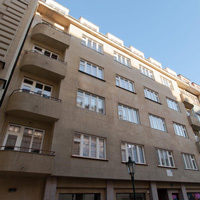 Prague City Apartments is the model of extended stay hosts, quickly attending to your every need. Staff was great. The location of their apartments is unbeatable. Thanks PCA for being so accommodating. Un appartement bien entretenu, un staff compÃ©tent, gentil et professionnel, des services: pratiques et bien organisÃ©s... Bref, venez Ã Prague et profitez ! Best way to see Prague for the first time! First and foremost, Prague City Apartments is a very professional organization. They were available 24/7, efficient, responsive and the communications was excellent. Our apartment was in a great location--supermarket, drop off laundry, Prague city offices nearby and walking distance to everything on our "must see on our first time in Prague list.. It was just what we neededâsecure, clean, well appointed and quiet. I can, without, hesitation highly recommend Prague City apartments.